Machining High-Temperature Materials Modern Machine Shop 85 grinding. Team members I met with included Technology Manager Robin Bright, Ph.D.; Senior Application Engineer Bruce Gustafson; Director of Bonded Abrasives Brian Rutkiewicz; and High-Performance Materials Technologist Philip Varghese, Ph.D.—all creep-feed experts who have been involved with a company initiative called "Machining-to-Grinding" aimed at helping support manufacturers making a transition from metal cutting to greater use of grinding. This initiative, which has focused on aerospace manu- facturers as they shift to difficult-to-machine alloys and composites, has also realized success for gear makers and now is finding applications in automotive manufacturing. I asked the team members what is important to understand about creep-feed grinding today. Their replies covered the following 10 points, the first of which explores the somewhat ambiguous question of just where creep-feed begins. 1. Creep-feed grinding has no formal definition. "There are no creep-feed police," Mr. Gustafson says. 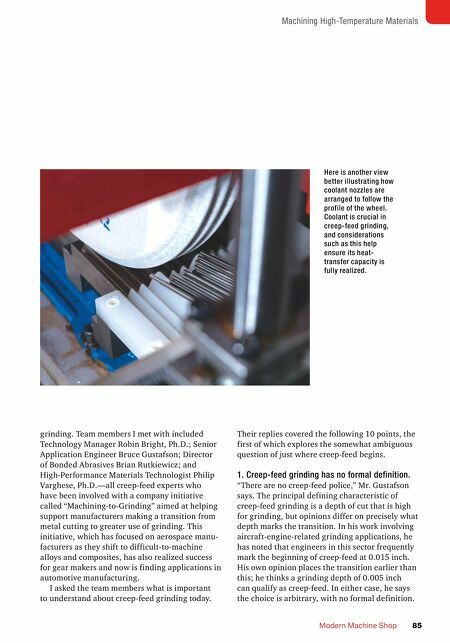 The principal defining characteristic of creep-feed grinding is a depth of cut that is high for grinding, but opinions differ on precisely what depth marks the transition. 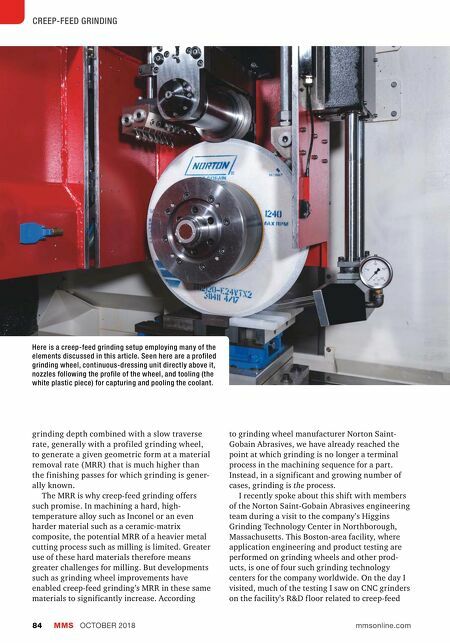 In his work involving aircraft-engine-related grinding applications, he has noted that engineers in this sector frequently mark the beginning of creep-feed at 0.015 inch. His own opinion places the transition earlier than this; he thinks a grinding depth of 0.005 inch can qualify as creep-feed. In either case, he says the choice is arbitrary, with no formal definition. Here is another view better illustrating how coolant nozzles are arranged to follow the profile of the wheel. Coolant is crucial in creep-feed grinding, and considerations such as this help ensure its heat- transfer capacity is fully realized.